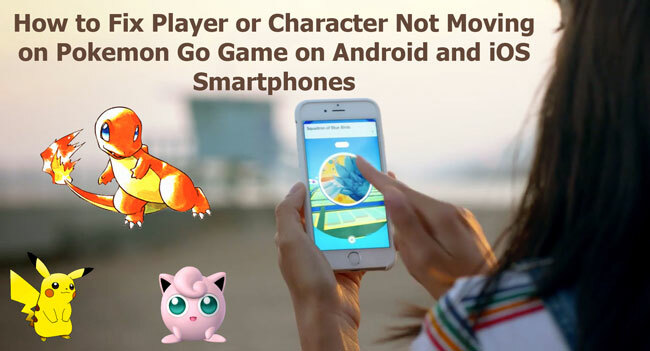 Fix Player not moving in Pokemon Go: Might be you are familiar with the gameplay of the Pokemon Go game, If not do look at Gameplay of Pokemon Go or Gameplay of Pokemon Go 0n Wikipedia. Pokemon go is completely real-world augmented game ie you need to move your device in order to move the character or player in the game. There is no buttons or joystick to control the game. This made users go crazy with Pokemon Go game. However, If you are playing the game for the first time you might face like Failed to Detect Location of Pokemon Go or Player or Character not moving in Pokemon Go. If you are the one facing with any of the above-mentioned issues, We have individual guides discussing each and every issue with Pokemon go game. >>> How to Fix “Failed to Detect Location of Pokemon Go on Android and iOS” Smartphones. Present here we will be dealing with How to Fix or Solve Character or Player not moving in Pokemon Go game on iOS and Android Devices. To far concern, Player not moving in Pokemon Go game error is related to GPS or Location issues with your devices or Server connectivity issues. So you need to take control of your device GPS and Location, to solve the person not moving in Pokemon go game on iOS and Android smartphones. We have 3 possible methods to fix your device Gps or Location and Pokemon go character or person not responding issue. I may not guarantee that issue will be fixed on following single method, So buddies try to follow all the method and solve the issue. Samsung, Motorola, Lenovo, Asus, Sony, Xiaomi, Lg holding Operating systems KitKat, Lollipop, Marshmallow can make use of this tutorial. All iOS devices can also follow this tutorial to fix Player not moving in Pokemon Go Game. Open settings of your device and open locations. Toggle this to green to activate. Also set to open and high accuracy mode to play without errors. Method 2: Disable mock locations of your device in developer options. 1. Go to “about phone”. Tap on build number numerous 4-7 times. Now this will open developer options. Go to mock locations and disable it. Pokemon Go character is not moving forward or backward or the game is frozen. This happens because of a bad Internet connection. You will observe issues like Player not moving or Pokeball got frozen when the game lost connectivity to the server. To re-establish connection follow below steps you need to close the app and then reopen it again. This will reconnect to Niantic’s servers and get back to the game. Press the Home button, Open a new Pokemon Go app. Then long press home button to see multitasking screen. Now choose the Pokémon Go card an select the Pokémon Go card to re-enter the app. Hope you guys Fixed issue character or the player not moving on Pokemon Go game. If you have any other solution or queries regarding Player or Character not moving in Pokemon go game ?? Shoot your comments in below comment box. Are you with any other Pokemon go game issue which is not available on our blog ??? You can request us through comment form. Thank you.